Okay, now THIS is a cool gift to get this Christmas. 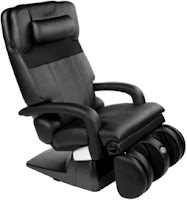 Forget La-Z-Boy, the Human Touch HT 7450 Zero Gravity Massage Chair can make both a good recliner and massage chair. The HT-7450 can reverse the effects of gravity on your body. When you recline on the HT-7450, your body will be in a virtual weightless state and their patented human touch massage system will massage your neck, back, and legs, leaving you feel energized and refresh. The HT-7450 also has an Acupoint Detection System that effectively targets the key pressure points on your back and adapts to any body size. The HT-7450 is also made from the finest materials, from the top grain leather upholstery to the Memory Foam Seat Cushion used by NASA astronauts and found in most expensive beds in the market. The HT-7450 also features a dual-lumbar back heat modules that warms your lower back muscles to reduce any tightness and pain, prepping you up for the best massage you’ll ever experience.